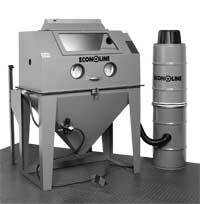 Econoline siphon blast cabinets are economically priced, have a minimum number of moving parts, and require less maintenance than a direct pressure system. So what are Siphon cabinets? 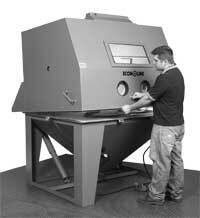 Also known as suction cabinets, they permit continuous blasting without pausing to refill abrasive media. Production rates are not as high as with a direct pressure system, but resulting finishes are comparable in quality. 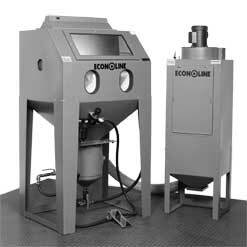 If you’re looking for low initial cost and easy maintenance, Econoline siphon blast cabinets meet the challenge. 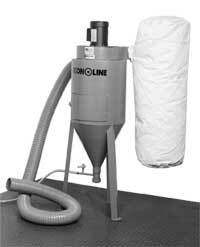 Abrasive is held in the storage hopper of the blast machine and delivered to the suction gun through a media hose. Compressed air is brought into the suction gun from the regulator through an air hose. As dry and regulated compressed air flows through the air jet, it passes through a mixing chamber before it enters the blast nozzle. Negative pressure, or suction, is created in the mixing chamber of the gun body and media is drawn into the blast nozzle, much as water is sucked through a straw. 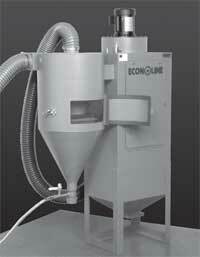 Looking for a specific type of blast cabinet siphon machine? You’ve come to the right place. Our products are available in a variety of sizes and styles. In addition, there are many factory options available that will increase your productivity and create an efficient operation. 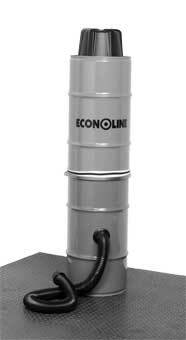 Please note: Econoline advises the use of a reclaim system when recoverable media is used. 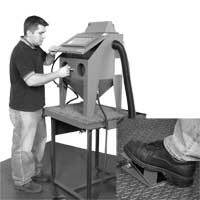 With 60" of working width and 48" of working depth, the 60 X 48 CB is a 25 CFM foot-operated blast cabinet that is as large as it is, powerful and will do the job, everytime. It comes with a 400 CFM dust collector (not shown) and tungsten carbide nozzle and air jet that provides you with a spacious solution that fits in most shop environments. Optional equipment includes carbon screen, turntable, 45 CFM gun, tumble basket, 150 or 600 CFM dust collector and reclaim system. Looking for easy loading and unloading? Try the clam shell design of the Super FT. This is an excellent choice for a mid-sized flip top machine. The 42 X 24 Super FT blast cabinet also includes a backrest assembly. 100 CFM dust collector, fluorescent lighting, 25 CFM foot pedal operated blast gun and a hopper door that makes media changes simple. 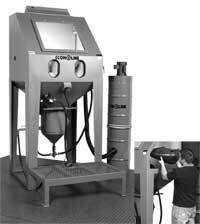 Optional features include airline filter, carbon screen, dust blow off gun, 12 CFM blast gun, boron carbide nozzle, tumble basket and turntable. The 36-1 Super features a standard 25 CFM blast gun with tungsten carbide nozzle and air jet, 100 CFM dust collector and fluorescent lighting. 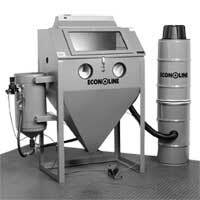 This is Econolines most popular model and includes side door access as well as easy to use flipper door on the front. Many optional features add versatility to this mid-sized cabinet, but a popular choice is a media reclaim system. 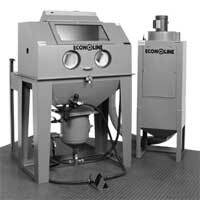 The Econoline Mini Bench is a compact blast cabinet with all the bells and whistles of a big unit, just on a smaller scale. This bench model comes with a standard shop vacuum dust collector, work gloves, easy to change window, door safety switch, foot operated blast gun with 12 CFM and a tungsten carbide nozzle and air jet. 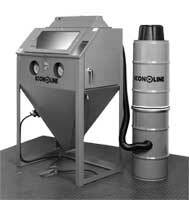 Optional features include an airline filter, carbon screen, dust blow off gun, 6 CFM blast gun, boron carbide nozzle and tumble basket. We feel that quality materials, tested designs and superior construction are important and we combine all of these features into every model at a reasonable price. Copyright (c) 2016 Econoline. All rights reserved.